Advent is a time of preparation, when we wait and prepare for the Christ child. Each week, you will light a new candle as we recognize the things that Christ brings to this world: hope, love, joy, and peace. 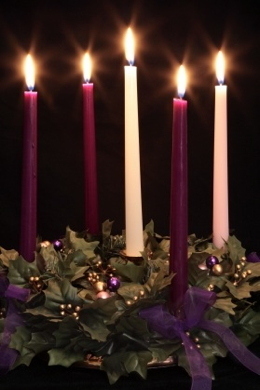 Advent is a time of waiting and anticipation, for at the end of Advent we celebrate Christmas and the Christ child. For children, the waiting feels like an eternity. Each devotion during this Advent season explores what each group was waiting for: last week we learned about the prophets who were waiting for something they’d never see (the Messiah). This week, our focus lies on Mary and Joseph, a couple waiting for the changes that come with a big transition: a new baby. Mary and Joseph waited for a miracle to happen for nine months. They knew that Jesus, the Son of God, would change their whole lives. And so they waited with anticipation for Jesus’ birth. There are things we wait for that change our whole lives: perhaps it is a move to a different state, the birth of a sibling, or going to college. These are things we look forward to, but at the same time they make us nervous. In moving to another state, we wonder if we will make new friends, if things will be good, and if we will like our new home. With the birth of a sibling, we worry if we’ll actually like him or her. As I waited for my sister to be born when I was seven, I told my mom that the baby had better be a girl because I was going to put a baby brother in the clothes hamper. I had prayed for a sister, and that’s what I was looking forward to. Any time a big change happens, we wait with excitement, but also with anxiety. Talk about changes that you and your family have gone through over the years: what was it like waiting for the change to happen? How did you prepare? Thank God for time to prepare for the celebration of Jesus’ birth. Ask God to show you how you can help others who are going through big changes.